At least that is how the world may be viewing Canada right now. Here we are, apparently one of the most sought out, highly regarded places to live in the world. Partly due to our economy, religious freedoms, multicultural acceptance, rich natural resources and our stable, peaceful society; but mainly due to the people who breathe life into this country Canada, that we call home. Now, splashed across TV screens and thrust through news media outlets far and wide, it seems that the very freedoms for which we are known and for which we have sacrificed dearly, have been assaulted by self-styled elements of anarchy who can at best be described as..well..idiotic. Canada is now hosting the G8 & G20 summits simultaneously, and much has been said about the associated expenditure and wisdom of holding such events in their respective locations. Public and community disruptions of Huntsville and Toronto and their surrounding environs notwithstanding, there has been a steady media diet of the pitfalls, pratfalls and downfalls of the aforementioned summits and anything and anyone connected with them. I will not get into the already overused and abused arguments about whether or not the G8/G20 summits are good for Canada or not, but I have to say that few if any, have actually sought out and reported anything good or beneficial about the summits. Initially we have been quick to decry (myself included) the alleged wisdom in the venues of choice. It seems as if our little zones of comfort have been abridged; nay, even trod upon without (in our minds) our due consideration. When did we become so bloody special? We are so used to levels of comfort and convenience that we are ready to lap up anything (mostly negative) fed to us, especially through the media that feeds our self-induced offence at being treated in this fashion. So, what were the leading headlines on television during the riotous and illegal activity that took place in Toronto over this past week-end? Well the riotous activity of course. In the midst of the media onslaught of imagery of what was taking place, almost drowned out by the noise of anarchy, were a few still small voices that acknowledged to the world that we, Canada, had again just lost a son and a daughter in Afghanistan. Two Canadian Forces medics were killed in a road side bombing. People like Claire Rolo – @roloclaire, summed it up succinctly on Twitter..“Lest we Forget. 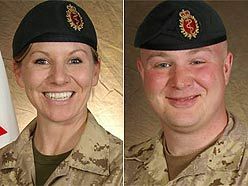 Two brave Canadian Soldiers were killed yesterday. Brave people, our thoughts are with their family”. Note the phrases..brave Canadian..Brave people. Here is the thing. Anarchists such as those profiled in Toronto over the week-end are not brave. They may be consumed with a self-deluded perception of their own worth, but what they demonstrated was just plain cowardice. They defined what Canada is NOT; not what Canada is, or stands for. We should be continually reminded of the levels of comfort our self-sacrificing soldiers have voluntarily given up for us, so that we could enjoy ours. Master Cpl. Kristal Giesebrecht 34, and Pvt. Andrew Miller 21, and all of those Canadians previously lost, did not give their lives for us to squander our freedoms and wallow in complacent comfort devoid of accountability and responsibility. I know I will not stand for it. Certainly not while I am a Canadian.